If I were to approach this race as I do in my Senate projections, here’s how the math would shake out: Per PPP the race is 53-41 (MoE 3.4) for a 97/3 split Blumenthal’s way. Moving on to POR/Rasmussen, we get a 52-42 (MoE 3) situation, for a 96/4 split. The third new poll from the CT Capitol Report by the Merriman River Group pegs the race at 52-45 (MoE 2.4). That tiny margin of error mitigates the benefit McMahon would get from a smaller deficit, so we still see a powerful 93/7 split Blumenthal’s way. But if I were doing my projection I would also include the other recent polls, including the one from Quinnipiac, which said 49-46 (MoE 3) for a 70/30 split. I’d also include Rasmussen Reports on the race with its 50-45 (MoE 4.5) showing, and a 72/28 split. All five are likely voter polls, so all five splits go into the average equally. Out from there comes a mean of 14.4, which I’d just go ahead and round to 15% so that I don’t have to constantly update every single race when tiny, random fluctuations occur. 15% isn’t great, but it’s in the realm of possibility. 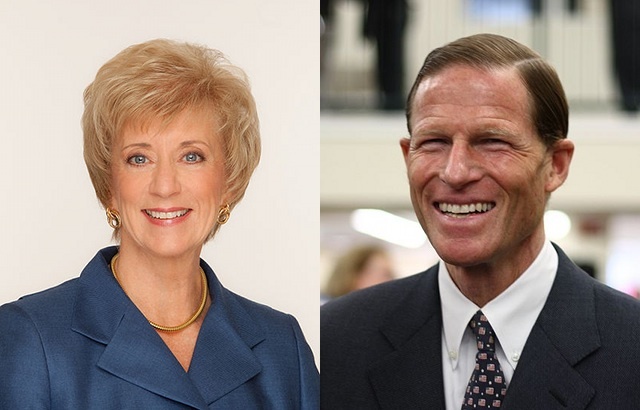 The key is going to be whether McMahon can narrow the gap again, or if Blumenthal can keep his distance this month.